The LUC logo incorporates Loyola's long tradition of academic excellence and its Jesuit identity. It consists of several elements, each referring to a significant event or tradition in Loyola's history or in the history of Jesuit education. 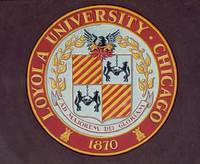 The Loyola University Chicago seal, approved for use only on diplomas and on certain official, legal applications.